Having finally mounted the plotter, I'm now sorting through that rather thick bundle of cables hanging below my cockpit floor. The plotter needs to interface with the DSC VHF Radio in order to provide location information and receive DSC target information. It also needs to interface with the auto-pilot's course computer to show waypoints being steered to, and provide location information. The catch is, my plotter only speaks "SeaTalk NG", and NMEA. No plain old "SeaTalk" is available, and that is what my ST60+ instruments need. The result of this is that I need to wire an NMEA interface between the plotter and both the VFH radio, and autopilot. For each NMEA connection there is a pair (positive and negative) of wires for a talker (sending) channel and a receiver (listening) channel. 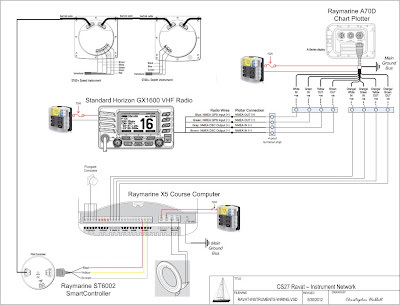 That means a bi-directional NMEA interface uses 4 conductors. I've chosen to use two 16/2 wires per channel. These will be terminated on a 4-post terminal strip on each end. 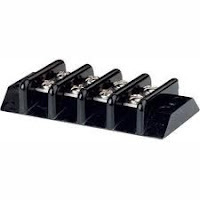 I'll use an additional strip for the power and ground terminations as well. The next thing I needed to do was start drawing pictures. Any time I add an electronic device to the boat, or install something marginally complicated I begin with a drawing. Nothing else seems to help me plan to the degree necessary, and nothing else will help me in six months if I need to troubleshoot. Documenting your boat's systems is a key form of seamanship, and a key method of making deposits in Vigor's Black Box. The final Instrument Network drawing is posted in PDF form in the Files section of this web site, and will hopefully be useful in the even that someone else needs a starting point for their own instrument network plan. I'll install the link with the VHF radio first since that will enable a key safety feature. I haven't locked in the final mounting location for the course computer, so I am not ready to set up the NMEA interface there yet. Hopefully soon, as I am very anxious to see it in action.